Wooden crate, audio recording and playback equipment, dimensions variable. Volt / USF Gallery, Bergen, Norway. Framed tabloid newspaper and theatre spot-light. Photo-montage of c-type zero frame prints. 20" x 24". 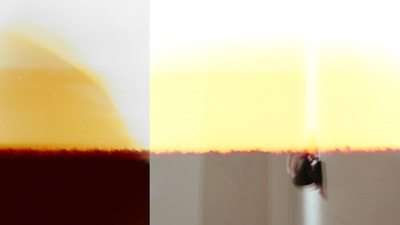 3 slide projections with single fading slides, dimensions variable. Wall mounted photo-document (20" x 24" on dibond), floor piece 17 x 1m2 paint on board and wooden pallet. Photographic collage on dibond 48" x 48" installed with six sheets of corrugated iron painted with red oxide. Aluminium tread plate and lightning conductor. 2-channel video installation dur.11 mins. Glycee print on dibond 40" x 60"
Wall mounted photo-document (20" x 24" on dibond), floor piece 12 x 1m2 paint on board and red oxide sack trolley. 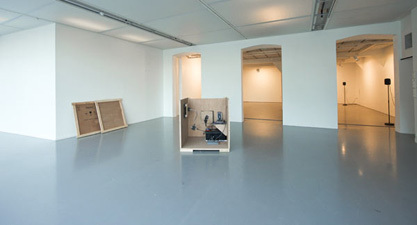 A standard issue wooden crate, empty aside from an audio recording device and large battery is collected from the artist's studio and shipped via land and sea to the Gallery. 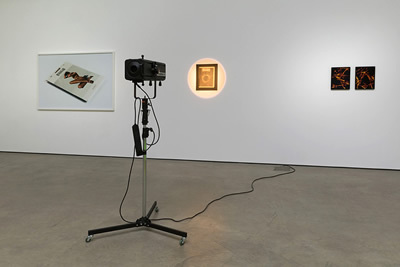 On arrival the crate is opened out and the sound that it recorded on the journey is played back into the gallery space. These normally discarded or unprinted images have instead been carefully hand printed and hung vertically in a series of photographic collages. Seen as a whole the 'burn out' line forms a continual horizon between a collection of otherwise disparate images around the gallery. At the point of 'burn out', where these images hang between abstraction and indexical figuration, the medium of celluloid photography looks to define its own fleeting sunset. 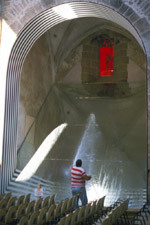 The projected slides are shown in different numbers and constellations with variable dimensions and adjusted according to the architectural context of the exhibition. 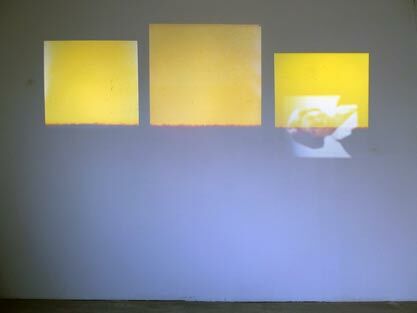 The single slides are reprinted for each exhibition and so slowly fade with the heat of their projection, thereby emulating the sunset they appear to depict. 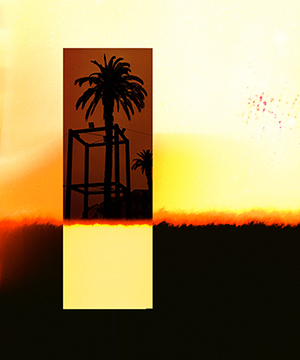 Ongoing series of photomontaged c-type zero frame prints. 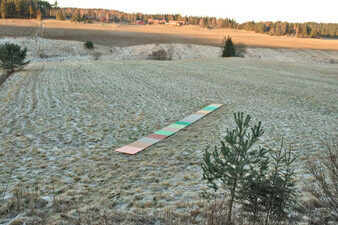 The work began as a search for a ‘typically Finnish’ landscape via conversations with local people. It was decided that an area close to the village of Lieto, 15km east of the City of Turku best fitted the description. A map of this area was matched to an autumnal satellite image from which a line of 17 pixels were chosen. These pixels were colour matched and carefully reproduced at 1:1 scale using paint and board. 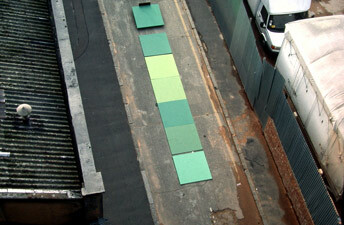 Intervention at the Fieldgate Gallery, 14 Fieldgate Street, London, E1 1ES. 15 September - 13 October 2007. Artists in the exhibition: Maria Anwander, Ruben Aubrecht, Paul Carter, Amanda Couch, Phil Coy, Cinzia Cremona, Richard Ducker, Shahram Entekhabi with Becky Ofek, Lothar Götz , Andrea Gregson, Andy Harper, Aisling Hedgecock, Charlie Jeffery, Christy Johnson, Fiona MacDonald, Sarah Pucill, Julian Hughes Watts , Laura White. Black spot was a process in three stages. 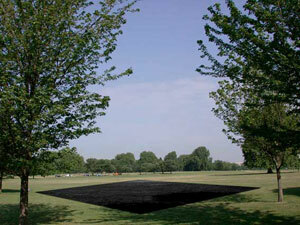 The first stage was to obtain a Satellite image of an area - in this instance Hyde Park, London. The second was to pinpoint a single pixel on that photograph and replace it with a black square of Polythene. The third was to take a second satellite photograph of the same area. Black Spot was a vain attempt to use basic analogue means to interfere with how a single pixel is seen or reflected from space. It was also an attempt at negation and an attempt to draw a line between the earth and the sky. In the gallery the work is presented as a tryptic photograph: The central panel of the tryptic appears to document the process of laying out the black polythene square. The side panels of the tryptic are Satellite photographs which appear to show the before and after this event. 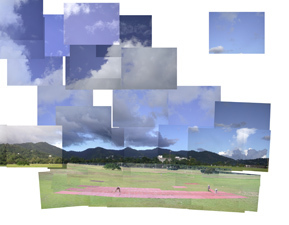 Photographic collage documenting pixel replacement using corrugated iron painted with red oxide in Port of Spain, Trinidad. 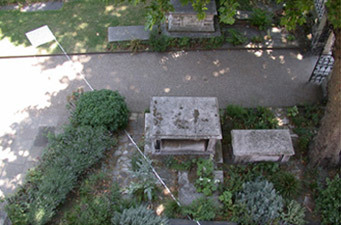 A one metre square aluminium tread plate attatched to lightning conductor of the church closest to William Blakes former residence at Hercules Gardens, London. Four pixels were reproduced from a satellite photograph of Les jardins du Champ de Mars in Paris. They were then placed in the position they originally represented under the Eiffel tower. A shot from the top of the Eiffel Tower makes a single slow pan and zoom shot that sweeps up from the green of the pixels on the ground to the blue of the sky above. 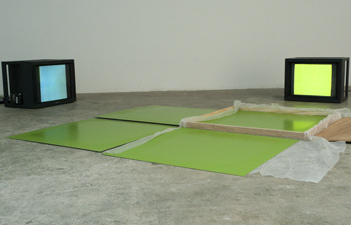 A stereo monitor installation depicts this movement between green and blue and through the figurative panorama of Paris. The crate which was used to transport the pixels is also displayed with the pixels as part of the installation. A digital image of a passing satellite taken at night with an early low resolution Nikon camera and enlarged to a 40" x 60" print without any further image manipulation. 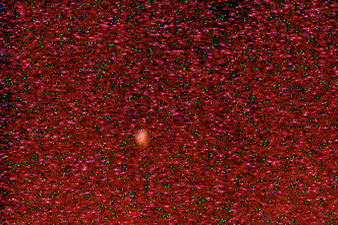 Of its own accord the camera's light sensor and processor produced a galaxy of red and green pixels in response to the low light conditions. 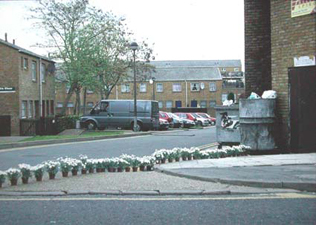 Series of photo-documents of a line drawn across Hackney, London with seasonal potted flowers. 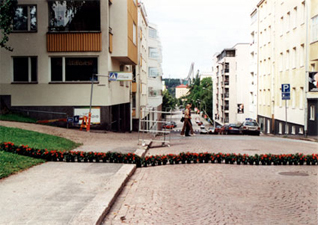 Series of photo-documents of a line drawn across Darmstadt, Germany with seasonal potted flowers. 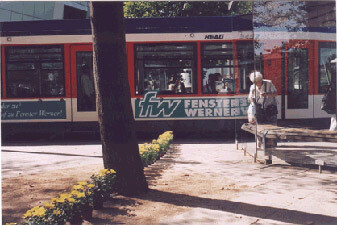 Postcard produced during a Duveen Travel scholarship on a journey insearch of Goethe's 'Urpflanze' beginning in Palermo and ending in Weimar.